Road works in Warwick that were delayed have now been rescheduled. Warwickshire County Council made a Temporary Traffic Order in February closing Cape Road from the junction with Northgate to the junction of Priory Mews, to vehicular traffic. The road is due to remain closed until the work, which was delayed, takes place. 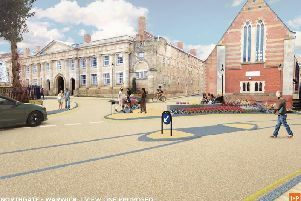 Warwick Town Council posted the following information on their website: “The closure was required to so that carriageway resurfacing and lining works to finalise the construction of the zebra crossing could take place. “Due to unforeseen circumstances dates of this closure, as originally advertised, were changed and commencement of the works were further delayed by the recent inclement weather. “Works have now been rescheduled to be carried out between 9am and 5pm on Sunday March 25, weather permitting. “Pedestrian access to and egress from properties and land situated adjacent to the length of road to be closed will be maintained at all times. Vehicular access will be maintained where possible. “An alternative route will be signed and is available via: Cape Road, Upper Cape, Wedgenock Lane, Birmingham Road, Saltisford, Northgate and vice versa.